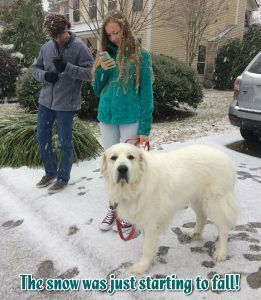 Mini Me Geology Blog » The Great 2018 Snowstorm in Charleston! The Great 2018 Snowstorm in Charleston! As many of you know, Mini Me Geology is based in Mount Pleasant, South Carolina, which is a suburb of Charleston. Last Wednesday, we had a record snowfall. The official measurement was 5.3″, which is the third highest snowfall on record and our biggest since 1989. We were not prepared. Historically, since we started keeping track we get a large enough snowfall to make a snowball or two every four years. When it is Winter Olympics time, we get a snowfall. In my freezer are snowballs from 2010, 2014 and 2018. We are looking forward to 2022! The downside, is the kids were supposed to go back to school last Thursday and they are still out today. The ice just won’t melt. Even when it warmed up yesterday, the ice was so thick in some of the shady areas that the entrance road to my daughter’s school still looked like a skating rink. While, I am looking forward to clearer roads, there is one fella who will be very, very sad to see the snow and ice go away. His name is Brutus (isn’t he cute!). Here are some more of our crazy snow pictures. I know this is a normal winter for some of you, but here…our palm trees were freezing!